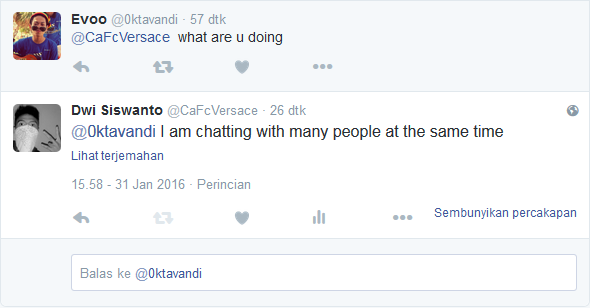 A few months ago, there is a wants to be made by me about the bot replies tweet (by simsimi). Sorry could only reply to the request at this time. Hihihi. What it SimSimi? 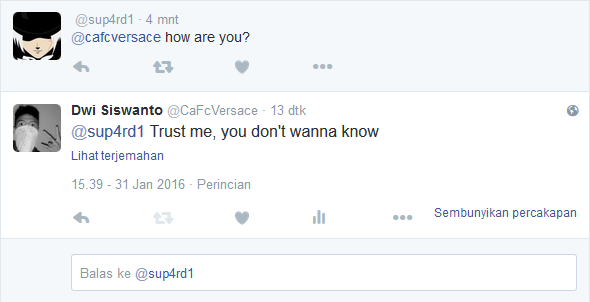 Previously I've explained the definition of simsimi on the post Bot Telegram SimSimi. So, at this point I don't need to be long-winded. First, download TwitterOAuth PHP Library by Abraham. Than you need consumer key, consumer secret, token key and token secret. You can find them at Twitter Application Management. Available az (Azerbaijani), de (Dutch), en (English), fr (French), it (Italian), pt (Portuguese), ru (Russian), es (Spanish), tl (Tagalog) and tr (Turkish). On line 18 defines as a log for the tweets that have been returned, in order to avoid duplicates. And the variable $tuit on line 23 that calls the function ambil(). Count is the number of tweets to be taken (mention). Recommend; 5.